Compton Sheriff’s Station is hosting a Community Academy. 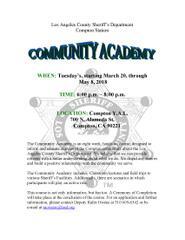 The Community Academy is an eight week, hands on course, designed to inform and educate citizens of the Compton community about the Los Angeles County Sheriff’s Department. If you are interested please contact Deputy Owens at 310-605-6542 or by email at raowens@lasd.org.